A little over two years ago, the world’s first Social Impact Bond (SIB) project to promote occupational well-being was announced in Finland. It covers approximately 1,600 public-sector employees. The occupational well-being services that they receive are paid for with funds collected from investors. The Local Register Office of Southwest Finland was the first employer to sign an agreement with the Occupational well-being SIB fund. Since May 2015, the agency’s employees in Turku, Pori, Rauma, Salo and Parainen have received services to promote occupational well-being – from personal fitness guidance and conflict resolution to supervisor training and joint development days for the whole staff. As agreed in the SIB, the local register office does not pay for any of the services it receives. Instead, the services are paid for with funds collected from SIB investors. In this case, the investors are Sitra, the We foundation and financial investor Henri Kulvik. The organisation only pays when the services produce results; in other words, a decrease in sick-leave days at the Local Register Office. The grounds for payment are impact rather than the number of services. “We’ve been given new electronic tools and many different types of tailored support. The services are really built according to our needs,” says Anne Oksanen, Manager of the Local Register Office of Southwest Finland. The responsibilities of local register offices include maintaining their regional Population Information System, guardianship matters, consumer advisory services and performing civil marriages. The Local Register Office of Southwest Finland employs 80 to 90 people. One of the tools that makes Oksanen’s day-to-day work easier is an electronic database that collects information about sick-leave days, notifies supervisors when a limit value is exceeded and reminds them of discussions with employees. These help determine the cause of absences and assess whether support should be offered or, for example, whether work duties should be reorganised. The Savo Consortium for Education (Sakky), the Aleksia municipal enterprise, which specialises in catering and cleaning services in Nurmijärvi, and Ylä-Savon SOTE Joint Municipal Authority have agreed on co-operation with the Occupational well-being SIB. A total of 1,580 public-sector employees are within the scope of SIB agreements and the related services. Based in eastern Finland, Coronaria Tietotaito Oy specialises in leadership development. It is one of the three service providers for the Occupational well-being SIB. The other two are a coalition led by Aino Health Management Oy, which is also responsible for the majority of the services, and Headsted Oy, which develops online programs to manage, for example, sleep problems and stress. “As service providers, the goal we share is the basis for building and tailoring services for customer needs. We listen to the customer and we only do things that all the participants consider sensible. We offer a wide range of services on a one-stop basis,” explains Pirkko-Liisa Hyttinen, who is a director and partner at Tietotaito Group. Some of the Occupational well-being SIB services are fixed, meaning that they run for the duration of the agreement. Additional tailored services are planned once a month at joint meetings involving the service providers, customers and Epiqus Oy, which manages the SIB project. A review of the productivity indicator – sick-leave days – is compiled at the same time. “Needs change, so it’s important to have flexible services that change over time,” stresses Hyttinen. The Occupational well-being SIB has already passed the halfway point. The employers involved between 2015 and 2017 recorded a total of 2,400 fewer sick-leave days than in a comparative period. This is equivalent to savings of approximately 9.5 person years. However, further improvement is needed in order to reach the target. The ambitious goal was a reduction of 2.1 sick-leave days per employee per year. “Sick-leave days per employee have dropped by an average of one day (0.94) per year. This represents a reduction of about 7% in relation to the comparative period,” explains Jussi Nykänen, a partner at Epiqus Oy. Epiqus manages the SIB fund and related project. “The largest employer – Sakky – held employee co-operation negotiations just before the start of the agreement, and this has had a significant effect on the results so far. The negotiations naturally had a negative impact on the atmosphere and caused a sharp rise in sick-leave days that has since levelled out,” says Nykänen. The price of a single sick-leave day is set at 350 euros in the SIB agreement. As a result, the public sector saves 350 euros for each day of absence that is avoided. The participants pay the fund 175 euros for this outcome, and they get to keep the remainder of the savings. Thus, the financial return of the SIB fund depends on how the targets set for well-being are realised. From the investor standpoint, it’s best if the sick-leave days drop as close as possible to the target level. In that case, they get their capital back and a reasonable return. Although sick-leave days are the indicator of impact in this project, the participants are aware that there is a bigger picture to consider. Sick-leave days at the Local Register Office of Southwest Finland were about 14.5 days per person at the start of the project. The number initially dropped clearly, then increased slightly and now stands at about 11 days per person, while the target was set at nine days at the end of the agreement. An unofficial indicator is provided by the annual job satisfaction survey organised by the state. The results for the Local Register Office of Southwest Finland have improved to the national target level in comparison to a slightly weaker performance in the years preceding the SIB project. Occupational well-being is rarely the responsibility of a single operator. For example, in addition to the agency itself, the Local Register Offices’ steering and development unit and the SIB fund have participated in development work at the Local Register Office of Southwest Finland. “It’s not always clear who is responsible for what. The roles and responsibilities in the SIB project should be more clearly defined from the very beginning,” says Anne Oksanen. 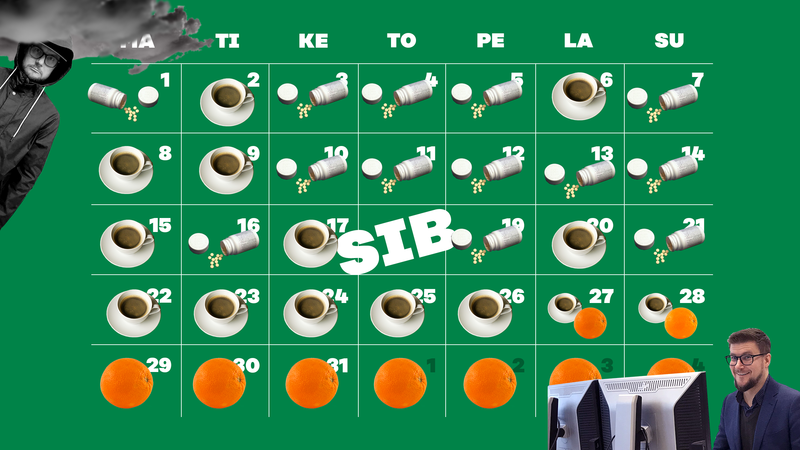 The Local Register Office of Southwest Finland and Sakky became part of the SIB project in 2015. Aleksia joined in early 2016 and Ylä-Savon SOTE Joint Municipal Authority in spring 2017, which makes it the newest member. The agreement term is three years for all participants. The first agreement ends in April of this year and the last in spring 2020, which is also when the final results of the fund will be calculated. The Ministry of Social Affairs and Health has commissioned an evaluation of the Occupational well-being SIB from the Finnish Institute of Occupational Health. The aim is to examine the implementation of tailored service models, the direct effects of interventions on occupational well-being and sick-leave days, and changes in the costs of people being unable to work. The work has begun, and the results will be reported in autumn 2019. The number of sick-leave days varies a lot by industry and professional group. This SIB project also includes different sectors – ranging from teaching to food and cleaning services and home care to administrative services. “The organisations had significant differences in the starting level for sick-leave days, so the target doesn’t look the same for all of them,” notes Pehkonen. The inability to work costs about seven billion euros per year in Finland, and the public sector accounts for about two billion of this sum. The majority – about two thirds – of the costs are associated with sick-leave days. Pay and other costs related to replacements are added to these figures. Within the public sector, sick leave accounts for some five per cent of total work time.